Han-Yuan, Yu, as known as B.c.N.y., is a freelance illustrator from Taiwan who had an MFA in Illustration at the Fashion Institute of Technology in New York City. Han-Yuan’s favorite subject is beautiful girls in aboriginal costumes. Han-Yuan wants to create compelling illustrations by using brilliant colors, interesting compositions, and dynamic gestures. Also, his work focuses on storytelling; Han-Yuan wants his audience to enjoy his work on a deeper level and to discover meanings beneath the beautiful exterior. 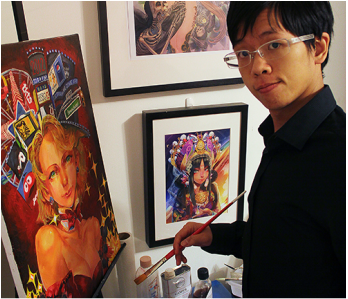 Han-Yuan has won many illustration awards and worked for many major publications and game companies. Han-Yuan’s work has been exhibited in museums and galleries internationally. He hopes his artwork can share his happiness. Three Illustrations depicted the park with woodcut style. ● Illustrations for EXOTIQUE 7 by Ballistic Media Pty. Ltd.
● Promotional illustration for online game “Blade and Soul” of NCTAIWAN. two illustrations of Honorable Mention, and one illustration of Mention. ● Illustrations were exhibited in Morocco International Festival of Animated Film-CASANIM / Digit'Art exhibition. ● Illustrations were exhibited in “The images of Taiwanese Aboriginal Culture” in New Taipei City Hall by New Taipei City Government Indigenous Peoples Department. ● Interviews by The Liberty Times, Taipei Times, CTI Television, Taiwan Television Enterprise, Ltd. about that I’m the first Taiwanese artist being the cover illustrator of International Professional Digital illustration magazine ImagineFX. ● Graduation project: musical online game "Orphean Episode" Served at the artistic director of the project and oversaw artistic design, design of 3D characters and backgrounds, animation, etc.